Bring your friends, family and coworkers to one of the best events of the year! This year we will be at AMF Pro 300 Lanes for our 7th Annual Charity Bowl-A-Thon! The theme is 1950's with an award for best team costume. Your registration includes unlimited games during the event, shoe rental, pizza, soda, and access to all our raffles and prizes. This is your chance to win a basketball signed by the Portland Trail Blazers! Proceeds will benefit HSMAI Oregon and Friends of the Children. It's an event you don't want to miss! You can register your full team and pay online through the registration link on this event. Max of 4 bowlers per team. 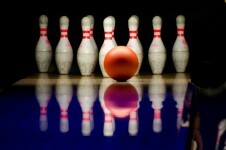 Bowlers can register partial teams/individually and we will assign you a team. Deadline for registration is June 16th, 2017, while lanes last! Any other activities you can do with kids!